Biscuit beetles are small brown beetles which – as you might expect – feed on foods such as biscuits and bread crumbs. As with moths and carpet beetles, it is the larvae of these pantry pests you have to worry about. 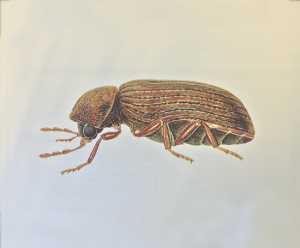 Biscuit beetle larvae are small white grubs, and are very active – feeding rapidly on different foods. Biscuit beetles are attracted to areas where food is stored, often targeting biscuits, flour, cereals and other dried foodstuff. Biscuit beetles can multiply quickly, and an infestation can be incredibly tough to deal with without the proper treatment and know-how. ClearFirst Pest Control provide expert beetle control throughout Derby and the surrounding areas. Our highly trained technicians will investigate the source of the infestation and deal with it swiftly and discreetly, as well as helping you to prevent further infestations in the future. For more information on all of our pest control services, don’t hesitate to get in touch with us today.